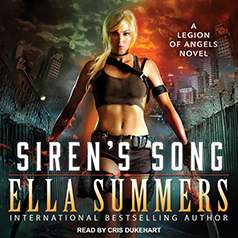 In Book 3 of the Legion of Angels series, Leda and Nero find themselves pitted against a rogue member of the Legion, a legendary angel as powerful as he is black-hearted. Leda Pierce's latest mission brings her back to her hometown at the edge of the Frontier. But things have taken a turn for the worse in the six months since she left home to join the Legion of Angels in New York City. Crime lords now rule over the town, and the beasts' numbers are exploding just beyond the great magic wall that separates humanity from the plains of monsters.